(Fortune) -- Private equity is coming back, and one of the field's biggest dogs is enthusiastically in the hunt. 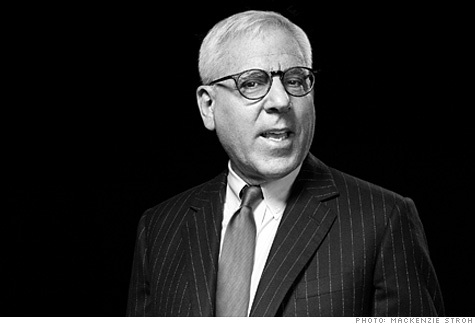 Carlyle Group co-founder David Rubenstein, 60, travels the world raising money from investors and looking for the next promising deal, striving to maintain Carlyle's amazing average return of 30% a year since its launch in 1987. The firm hit a rough patch in 2008, as funding dried up and a high-profile, publicly traded fund, Carlyle Capital, failed. Now Carlyle is buying aggressively -- especially in China and other developing markets. Rubenstein claims he's working harder than ever, which is saying something. As a young adviser to President Jimmy Carter, he was known as the staffer who got to the West Wing earliest in the morning and left the latest at night. But Carlyle's business model demands hard work, since the firm does lots of small deals, rather than a few big ones like some of its major competitors. The effort has paid off for Rubenstein, a vegetarian teetotaler who speaks softly and carefully; he's worth something north of $2 billion. Carlyle has hundreds of investments -- more than any other private equity firm by far -- which gives you an unmatched window onto the economy. What's the outlook? We own 231 companies around the world -- either controlling stakes or partial stakes -- and that does give us a good window on what's happening. Predicting the economy is difficult, but based on what we see today, I think the U.S. economy will probably grow about 2% to 3% this year. The most important thing to remember is that the U.S. economy went through more or less a heart attack. A heart attack is not fatal these days -- it's something we can correct -- but we still have massive unemployment. We have a very high deficit, which is likely to be around $1.6 trillion a year. And we've got about $14 trillion of debt on our balance sheet, not counting unfunded pension liabilities for Social Security, Medicare, and Medicaid. So we have a lot of problems to work our way out of before we're back to an economy we can be proud of again. So you'll be doing most of your investing outside the U.S.? No. We're investing probably as much in the U.S. as we are outside it, and that's different from most private equity firms based here. China, India, and Brazil are unrivaled opportunities now for people like us. But the U.S. is still a place where you have the greatest rule of law, the greatest transparency, the greatest governance, the greatest opportunities, the greatest chief executives to run these companies. So it's still a terrific place to invest. But you have to remember that growth won't be very good, and therefore you should adjust your pricing to reflect that. 0:00 /3:26Carlyle co-founder: Invest in the U.S.
Do you worry about inflation, possibly very significant inflation, down the road for the U.S.? Well, I'm an expert on that. In the Carter White House, I got it to 19% -- very difficult to do. I've often said to people in the Federal Reserve, If you're worried about deflation, bring me back, because I can cure that problem. For the past 20-plus years we've had about 2½% inflation. I suspect that in the next two or three years, as the excess capacity is absorbed, and people begin to want higher wages, and we begin to pay off this enormous debt, you'll see inflation go to 4% to 5%. You were quoted not long ago as saying, "I regard China as the single most attractive place in the world for us to invest at the moment." How come? For 15 of the last 18 centuries, China was the biggest economy in the world. It went down in the 1700s as Europe came up, and the U.S. has been the biggest economy since 1870. For example, about 30% of the Chinese economy is focused on consumer spending. Our economy is about 70% focused on consumer spending. China will build up its domestic consumer spending, and that will produce a lot of opportunities to produce products for those consumers. In addition, you have to consider the growth rates. We're going to grow 2% to 3% a year. China is going to grow 8% to 10% a year. Given its size, growing at that rate gives enormous opportunities to invest. You've been doing that already. Yes, we've invested more in China than any other private equity firm -- about $2.5 billion of equity and forty-some transactions in real estate, venture, and buyout types of investments. We have about 45 full-time professionals investing in China. All of them are Chinese natives who were educated in the U.S. or other places, in some cases China. We cannot put enough money in China. We'll do every good deal we can find. And you're confident an outsider can get a fair deal in China. There's no doubt that if you're a Chinese investing in China, you may have an advantage, just as an American investing in America may have an advantage. However, the Chinese have been reasonably open to people like us. But we had to have a Chinese face on us. Every one of our professionals is a Chinese native. I feel we are welcome there. And many of the government officials there are relatively easy to meet -- in fact easier to meet than probably in any other country in the world. You recently bought a company in Brazil. The old joke is that Brazil is the country of the future -- and always will be. Has the future finally come? Think about this: Brazil has the fifth-largest population in the world, but historically it's had problems with its currency, inflation, and so forth. Now the currency is under control -- actually, it's appreciating against the dollar -- and inflation has been very, very modest over the past couple of years. The enormous natural resources there are really unbelievable, and Brazil will probably have, in the not-too-distant future, the fifth-biggest GDP in the world. Most important, private equity penetration is very, very small, so there's very little competition. What do you especially like around the rest of the world? We do like India. We think it will be the second-largest economy in the world in our lifetime. Ironically, even though English is spoken there, we find it easier to do business in China. But India is still a large economy. I think the Middle East also offers enormous opportunities. We're going to be dependent on carbon energy for some time. As a result, the Middle East will do quite well, and more and more money will be invested there as people want to build up their own infrastructure and their own economies. But I don't want to get away from the U.S. It's still the place where you have the most advantageous opportunities for investing because of the rule of law, the transparency of the governance, and a wealth of opportunities -- probably more than in any other country. One sector Carlyle focuses on is health care. A lot of investors think it's risky because of what might happen with health-care reform in the U.S. How do you see it? When I was in the White House about 30 years ago, the expenditure of our GDP in health care was 6% to 8%. It's now about 18%. As the baby boomers like me are retiring and getting ready to retire, they will spend whatever it takes -- and they're the wealthiest generation in our country -- to make themselves live an enjoyable life in their retirement years. Artificial hips, artificial knees, plastic surgery, assisted living, whatever it takes to make them feel happier, they're going to spend that money, and they can afford to do it. So you're going to see more and more of our GDP going into health care, and I think any health-care legislation that passes Congress will just exacerbate the situation. The details of how Carlyle achieves its 30% annualized return are critical. What's the most important part about managing one of your portfolio companies? Private equity didn't have a very good reputation for managing its portfolio companies in the early years. It was thought that we just leveraged companies up and let a manager depend on GDP growth to exit and make a good return. Now private equity firms are spending enormous time bringing in people like [former IBM CEO] Lou Gerstner, who we brought in, or [former GE CEO] Jack Welch, who went to another firm [Clayton Dubilier & Rice]. People who have a lot of management skills are increasingly bringing a lot more value-added operational skills to these companies. We recognize that we have to make these companies more efficient, and we're doing so. What changes in these companies -- what's different after you own them? The concept behind private equity, a very novel idea, is that you buy a company and then make the manager an owner. Many of these people were just division managers with modest salaries. Now they're owners, and all of a sudden they think of ways to make efficiencies that they didn't think of before. Also, by operating in a private setting, not worrying about public quarterly returns, you can get people to think about a longer-term investment in a company and do things you wouldn't if you were a public company. But the most important thing we add is a sense that there are ways to make companies more efficient, and get management and employees to focus together by making them all owners. In fact employees typically own a fair amount of the companies that we invest in. Does private equity have an advantage in attracting managerial talent? You can give managers a chance to make much more money than they could make in a publicly traded company. The famous example is Dave Calhoun, who left GE to go to a Carlyle portfolio company, Nielsen, with reportedly a chance to earn nine figures if it succeeds. He was a vice chairman of GE (GE, Fortune 500), but his compensation would be relatively capped. We could give him enough of an incentive that the wealth he could create would be much more than he could ever have gotten at GE, no matter how high he might have risen. He also invested a lot of his own money, and can make a profit on that as well. So yes, people can make more money in private equity if they perform. If you don't perform, you can lose money. You've become a very active philanthropist. The world does not lack for problems to be solved. How do you decide where to focus your efforts? There's no good answer, of course. Anybody who gives away money is mostly looking at things where they think they can make a difference. I'm trying to help people who helped me, educational institutions that helped me with scholarships, or organizations that were very useful to me in growing up. As you look back at your career so far, what have you learned about what it takes to achieve what you want to achieve? I don't think you can plan your career. I had thought I would spend my career as a lawyer or in government or in politics, and I really wasn't good at any of those things. I got into things I'm doing now through luck and serendipity. The things I've taken away are, one, hard work is probably the most important quality. Doing what you love is really important. Don't do something your parents wanted you to do, but do something you really love. Getting along with people is essential. You can't make other people do things. You've got to persuade them. Richard Neustadt wrote a famous book called The Power of the Presidency, and he said the power of the presidency is the power to persuade. That's true of all business activities. You're really persuading people through writing or oral communications. So learning how to persuade people, how to communicate, is very important. And I think people should recognize that intelligence is helpful, but if you're too smart, you might outwit yourself. I don't think geniuses necessarily do as well in business as people who are reasonably intelligent.